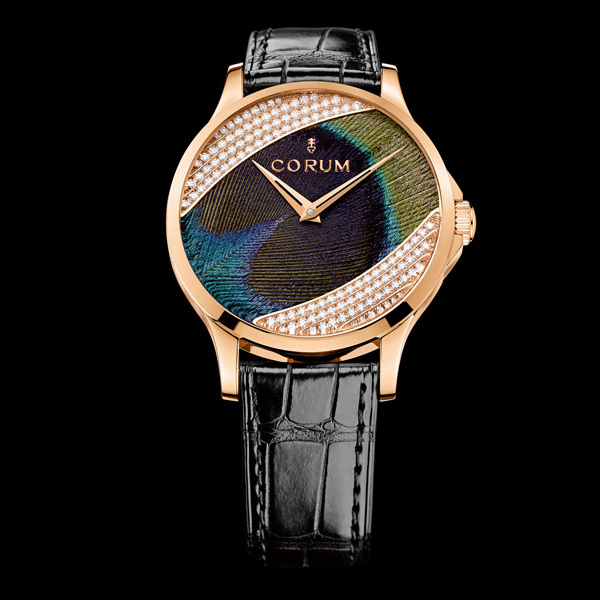 Preserving traditions while remaining resolutely contemporary is an art that is perfectly illustrated in the pair of Feather Watch models by Corum. The design is a tribute to a 1970s timepieces and the 5N 18K red gold case comes in a finely wrought 39 mm diameter. The dials are preciously set with peacock feathers and on one model the feathers are framed by 120 round-cut diamonds (approx. 0.71 cts). The design and execution of these models are distinguished by a blend of excellence and virtuosity. The story begins with the full force of Corum’s expertise and passionate dedication. The brand has drawn on its history in conceiving a unique line that pursues watchmaking’s perpetual quest to explore the ties between classicism and modernity, between fine mechanics and age-old arts. The two Feather Watch models reveal an exquisitely graceful dimension with two dials made from peacock feathers. Much in vogue during the 19th century, plumasserie, or feather art, remains an enduring symbol of elegance. 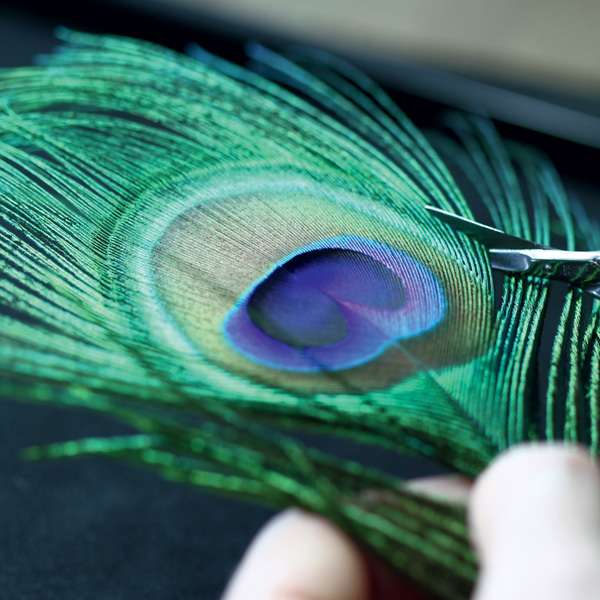 Displaying infinite patience, meticulous care and dexterity, the feather artist expresses whimsical poetry, raising this precious handcraft to the ultimate level of perfection. The feathers are rigorously sorted and chosen for their stability, their density and their finesse, before being cleaned, steam stabilized and re-cut by hand. This art then rejoins that of marquetry, as the feathers are individually positioned in order to reproduce the desired motif before being glued flat. The magnificent and original result beautifully enhances the dials of these Feather Watch models. 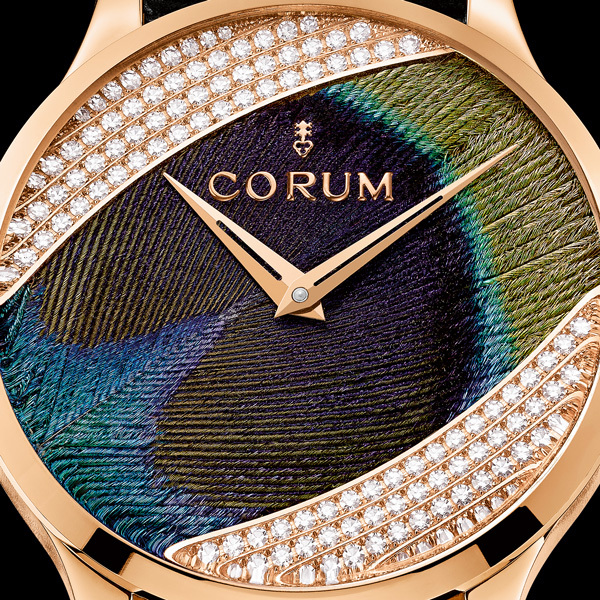 The first stems from an artistic union brimming with vibrant colors; while the second is an encounter between watchmaking, feather art and jewelry with its 120 diamonds totaling 0.71 carats framing the feathers on the dial. Adding the final touch of refinement, these models are secured to the wrist with an integrated black crocodile strap featuring a curved spring-bar. Beating at the heart of these exceptional timepieces, representing authentic works of art, is an automatic CO 082 movement that is bound to delight devotees of subtle mechanics. It oscillates at the frequency of 28,800 vibrations per hour, drives the hour and minute hands and has a 42-hour power reserve. The gilded oscillating weight engraved with the Corum coat-of-arms is visible through the transparent case-back of this model waterresistant to 50 meters. The mechanism is a fine match for the refined and timeless aesthetic of this creation. The openworked dauphine-type hands sweep gracefully around the dial, crossing paths with the Corum logo transferred onto the sapphire crystal. The 39mm case in 18K red gold features a fluted bezel engraved with the key symbol, discreetly echoing the Corum universe. These two new creations will dazzle collectors of rare pieces, enabling them to admire inone sweeping gaze both the steady flow of time and the beauty of a dial resembling anornate painting and dedicated to an ancestral ornamental technique.